Chrysalis, the first episode of Life is Strange, is now available, and as is the custom it's got a launch trailer that sets up the game's characters, background, and a Big Secret Mystery. (Spoiler: Max can reverse time.) The developers at Dontnod also revealed a bit about what players can expect from the intro chapter, and how it will extend over the course of the full game. The opening chapter is "basically an introduction to the world of Life is Strange," the studio said in a press release. 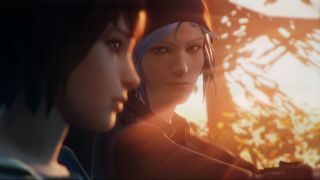 Players will make decisions that will influence the destinies of Max and Chloe in the wake of their reunion, but while some of the consequences of these choices will be immediately apparent, Dontnod warned that "there are also mid and long-term repercussions that will pan out over the course of the later episodes, in a butterfly effect manner." Chrysalis will also serve as an introduction to the game's mechanics, although those will evolve over the course of the game as well, as interactions and "rewinds"—that is, Max's ability to reverse time—grow in complexity. Life is Strange is available now on Steam, in individual chapters or as a "complete season" bundle. The Life is Strange soundtrack is also up for your listening pleasure on Spotify and YouTube.